Since 2016, F.Fonseca has maintained the solidarity initiative in the scope of the annual customer satisfaction questionnaire. For each questionnaire answered, 5€ reverted in full to Aveiro Red Cross institution. F.Fonseca's customers are very sensitive to initiatives of this nature, which usually translates into success and this year was no exception, resulting in the amount of 750€, the highest ever! 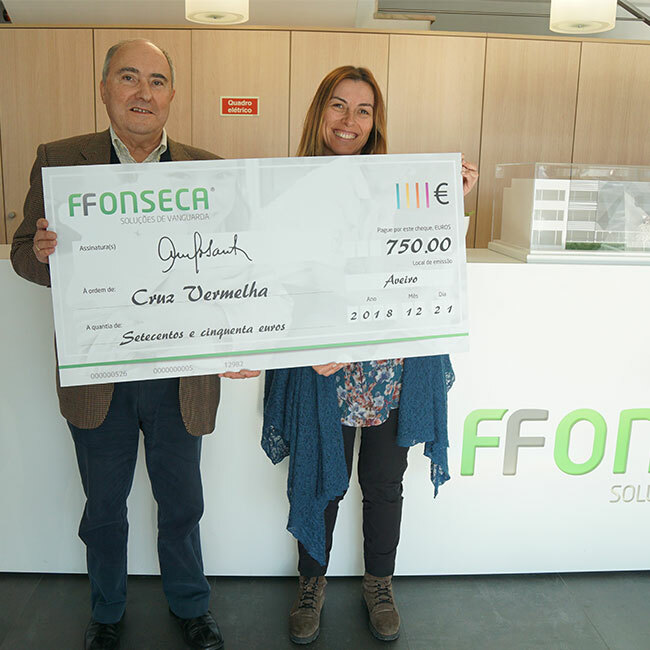 As in the previous year, the presentation of the solidarity check symbolizing the donation was held at F.Fonseca headquarters in January 14th , 2018, with the presence of the new President of the Institution, Dr. Elsa Rocha and the F.Fonseca C.E.O., Carlos Gonçalves. This support, according to the Red Cross should be applied to existing equipment in the travel trailers for external support, which provide support for example to Fátima pilgrims, since they are very old equipment. The Red Cross, like many other institutions, survive for the most part in donations, so F.Fonseca's goal is not only to materialize this support whenever possible, but above all to spread the initiative to other entities in the sense that these, within their activities, can also contribute and help those most in need. At the end of the day this should be one of the missions of any public or private organization.